Because the conditions that cause sudden arrhythmic death syndrome (SADS) can be inherited it is important that, if you are a blood relative in the immediate family of someone who has died of SADS, you are evaluated for signs of these diseases, particularly the ion channelopathies. There may also have been other sudden or suspicious deaths in your family, including cot deaths, suggesting that there may be an underlying inheritable condition. Below, we explain what is involved in the evaluation and describe the tests you may need to have. It is vital that a clear history of the victim and his or her death is established, using the family’s and friends’ recollections as well as the reports of the coroner, pathologist, GP and police. For example, fits brought on by exercise can be due to an underlying channelopathy such as long QT syndrome (LQTS) or Catecholaminergic Polymorphic Ventricular Tachycardia (CPVT), or a sudden cardiac death during sleep may have been caused by sodium channel LQTS or Brugada Syndrome. It is also important to find out about any medications and any potentially dangerous drugs that the person may have taken before they died. Your doctor may ask you if you have ever had symptoms such as blackouts or palpitations as these may suggest underlying heart disease. A medical examination may help to discover if there is an inheritable structural heart disease in the family. For example, if there is mitral valve prolapse with leakage from the valve this will cause a ‘murmur’ that a doctor can hear through a stethoscope. Your doctor may suggest that you have some of the tests we describe below. This is the most basic test. It involves taping electrical leads onto your legs, arms and chest to take readings of the electrical activity of your heart. These are prined out onto a piece of paper for the doctor to examine. If the first ECG does not show any sign of a channelopathy, the test can be repeated later. This is an ECG that adds together the electrical readings from at least 250 heartbeats so that any very subtle variations can be seen – for example if the electrical impulses in the heart are being conducted more slowly. It is useful for diagnosing Brugada Syndrome, PCCD or ARVC. This test uses ultrasound waves to look at the structure of the heart. It is useful for people whose ECG shows changes that could be caused either by a channelopathy or by uninherited heart disease that has damaged the heart – for example a previous heart attack that you may not have even been aware of. 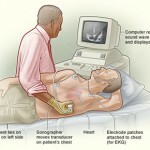 An echocardiogram can also detect inheritable conditions such as cardiomyopathy and mitral valve prolapse. This test is the same as the ECG described on page 16 but is recorded before, during and after a period of time spent exercising on a treadmill or an exercise bike. This allows the doctor to examine any changes in the electrical patterns that occur with exercise, and analyse any abnormalities. This test is particularly useful in detecting some of the features that are characteristic of LQTS or CPVT. Some hospitals may also ask you to do a cardiopulmonary exercise test. 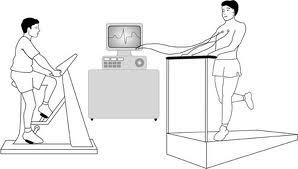 This test analyses the efficiency of the heart muscle by measuring the amounts of oxygen your body uses during exercise. You will be asked to breathe into special equipment while you are exercising. If the efficiency of your heart is low, this may suggest that you have cardiomyopathy (inefficient pumping action of the heart). The Holter is a recording device that comes in two different forms: a small portable tape recorder (like a walkman), or a small digital device the shape of a pager. You wear the device on a belt round your waist. 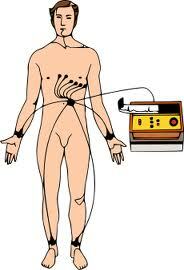 Four or six ECG leads from the device are taped to your chest. The device records the electrical activity of your heart for 24 to 48 hours, or for up to 7 days if a digital one is used. The doctor can then analyse theelectrical activity and rhythm of your heart to find out if you haveany arrhythmias (for example, the arrhythmias typical of LQTS andCPVT), or some of the other features characteristic of LQTS. * Tests marked with a * are non-invasive. ‘Non-invasive’ means that it does not involve penetrating the skin or body. This entry was posted in Heart Disease and tagged brugada syndrome, cardiac test, Catecholaminergic Polymorphic Ventricular Tachycardia, channelopathy, heart disease, long QT syndrome, mitral valve prolapse, murmur, palpitations, sudden arrythmic disease syndrome on May 6, 2012 by alwin.